If this is your first time here, then an especially big welcome to you 😊 I'd love to have you sign up for my newsletter, The Bulletin. If you do, I'll send you a link to download my Wind Farm quilt pattern, which is only available to subscribers. Then I'll pop into your inbox on the 16th of each month with a roundup of fun things to make, a family favourite recipe and news from here on my blog. I hope you'll join me! The blankets are 12" x 17" and close with a button and loop (made from a hair elastic). I layered the inside, outside and batting together, stitched around and then turned it all right side out and stitched around it again. Attaching all of the activities acts as quilting to hold everything together in the center. Here's the inside. I stuck with the same activities as in the other fidget blankets. 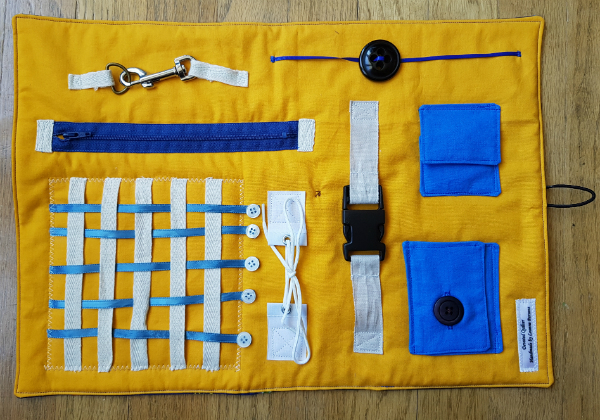 There are ribbons for weaving, a zipper, laces to tie, a button to slide on a ribbon and a couple of different buckles for repeated opening and closing. There is also a velcro closed pocket and a button panel. I used the automatic buttonhole maker that came with my machine, but I do need to do a little more practicing to get the buttonhole properly centered. There's a little rocket surprise inside the button panel. 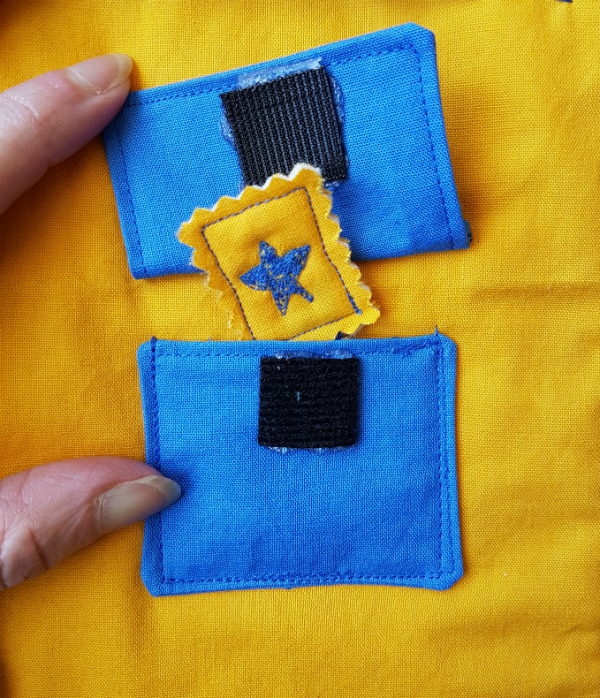 And a little star on a ribbon inside the velcro pocket. Very creative! 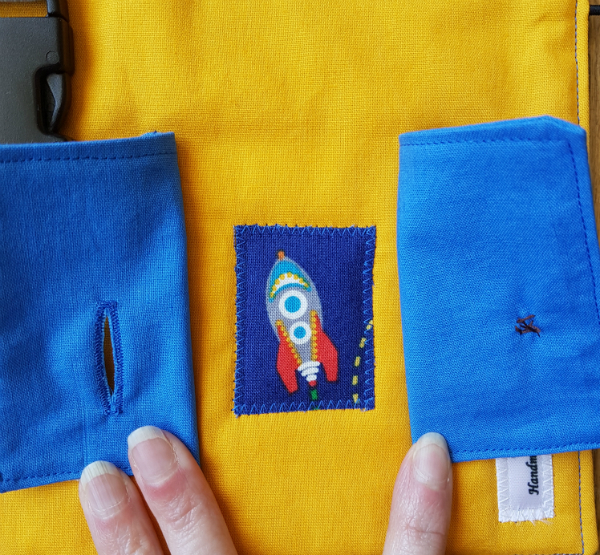 And I love the rocket fabric. Great job!!! Some fun and creative ideas for your fidget quilt! At our guild meeting this month, we will be putting together fidget quilt to donate. Its a great idea and the need is there! Leanne, this is such a great project. My father-in-law passed away from early onset Alzheimers and it was such a sad time to see him like that. This sort of thing would have been great during that time. You put lots of thought into this and did a great job with it! Leanne, your fidget blanket is fantastic. Using an elastic hairband as a button loop is just plain genius, by the way. Thanks for hosting the linky and thank you for putting your love and talent into these special projects for special needs children! Great finish. Hopefully it will assist the teacher. What an AWESOME fidget quilt!!! Your fidget blanket is awesome and knowing who it is for makes it even better. I would maybe use them at church with my grand children.